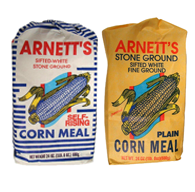 Arnett’s Stone Ground Plain Corn Meal is the basis for many fine Southern meals. The process of stone grinding dried corn allows more of the hull and germ to be retained in the meal which lends more flavor and a bit more nutritional value. Arnett’s, particularly popular in Georgia and picking up in other regions, is a member of the China Doll Rice and Bean, Inc. family of fine Southern foods.